Okay. This stash won't qualify me for neatest studio. What you are seeing here is approx 1/3 of my working stash. 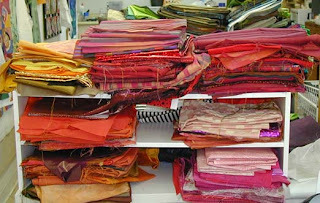 These are a collection of mostly silks-- hand-dyed and not, metallics, cotton prints and stripes. I have an entire 8 x 10 room with my undyed fabrics plus older cottons etc. Those are mostly in stacks and boxes so I'm skipping sharing those with you. 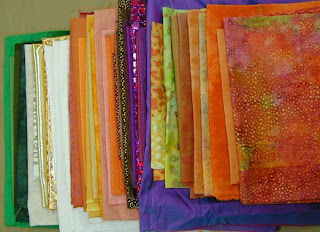 This is the other side of that mess--my golds, yellows, pinks, reds & oranges. 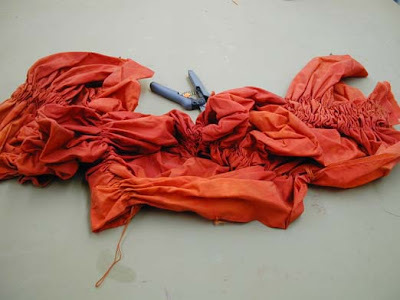 I didn't dye any new fabrics for the front of this piece. 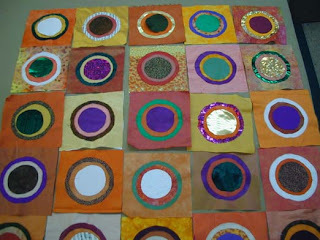 This is round 1 with the initial blocks and circles before any stitching. This is round 2. 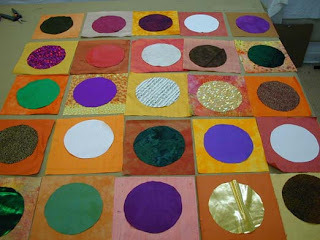 The newest layer of circles came from the underside- the bottom layer. We're robbing Peter to pay Paul. Gee- sounds like my life! This is round 3. 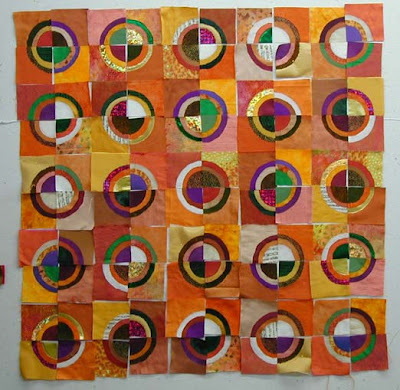 This layer came from the bottom again but it was the original circles that are used. As you can see, I scramble each time so the same fabrics don't repeat on a single block. After building the blocks I then cut them into quarters. I call them quadrants. The challenge here is to replicate randomity. It isn't as random as it looks. This is the fabric for the back. I have gathered for shibori. The effect came out more subtle than I expected so I'll not give it a big ta-dah! Okay. now I am excited. I made these stamps from craft foam. It is 2 layers of craft foam adhered to plexiglas. 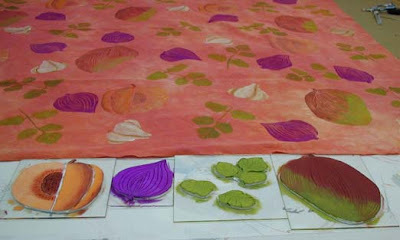 I paint the stamps with a brush and then lay it down onto the fabric and apply pressure. Here's the overall effect. Keep in mind--this is the back. Here I have layered the top, cotton batting and the back. 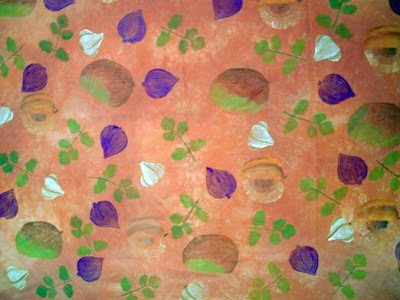 You can still see the tracing paper that I used as patterns for the images I stitched into it. Ta--dah!!!!! 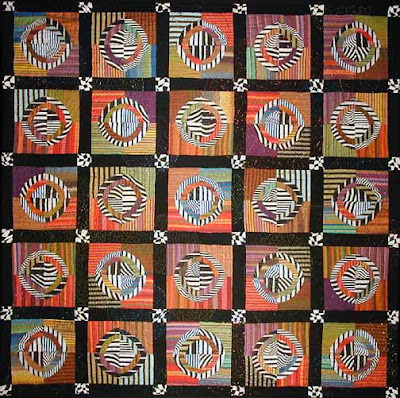 Here's the completed quilt. Size is 35" x 35"
I FINALLY remembered to photograph the completed back. The thread for the back was a varigated peach to cream. 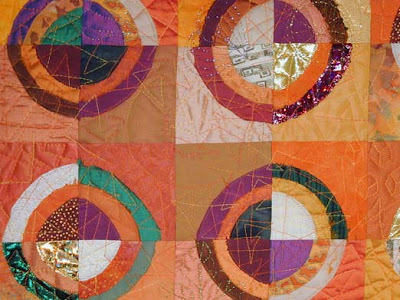 Here's a detail shot of the front showing the variety of stitching. The small boxes are chopped up mangoes, there are peaches, cilantro and lemon in this shot. There are also red onion and garlic. In between the ingredients I did a jagged roughly triangular pattern. 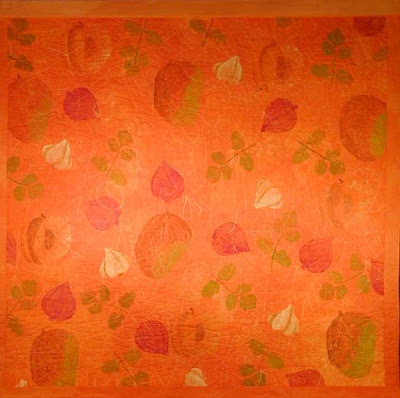 Most of the ingredients are stitched in various metallic threads. 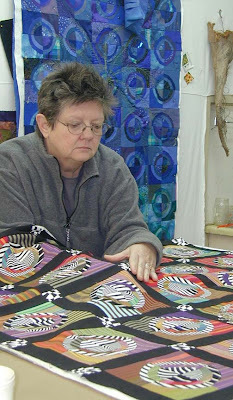 Here I am pinning the three layers together before quilting. I use large safety pins . 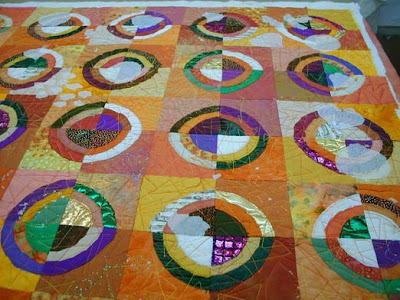 Here's the detail shot showing some of the quilting. I mostly used metallics for the insides of my balls and an invisible smoke thread for the spaces in between the balls. The balls had mostly stippling and the spaces had mostly jagged box shapes. Finally I remembered to photograph the back of this one. I almost always forget to get a shot of the back. The thread in my bobbin- which is what you see here- is a variegated black to white. That's why the stitching seems to come and go. All in all I am very tickled with this piece. I wonder what I'm going to do next. As I was lying awake last night, after too many cups of coffee, I kept getting partial images of a concept. 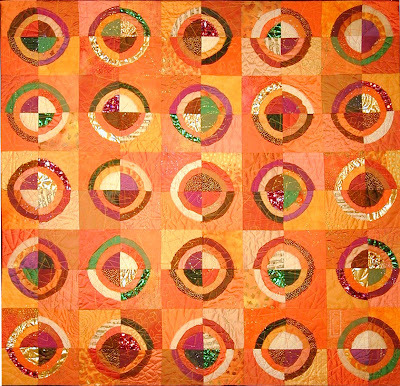 One of my first circle quilts was called "Holy Guacamole." I used various fabrics to represent the various ingredients in guacamole. I'm thinking of a similar idea but with different foods. I'm thinking "Pico de Gallo", "Orange Marmelade" and "Peach-Mango Salsa." Are you hungry yet? It seems to me that if I added the fabrics in somewhat similar percentages to what they are in the actual foods then the look should be about right. Guess we'll just have to see. 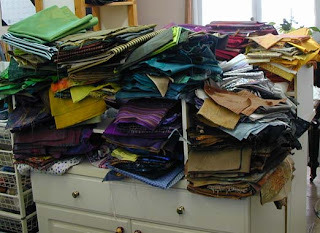 I think I'll wait until tomorrow to dig through my fabric stash. During the period while my kids were growing up my creative efforts were pretty restricted to cooking- which I love! Hah! 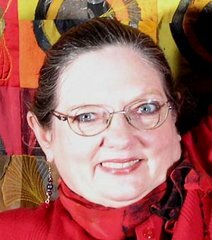 I even got a 4 forks review for the food I provided for the Visual Arts Alliance of Nashville's Art Show. That was well before I had figured out my medium. I was keeping those creative juices alive until I could focus later. That ought to get things started. Tomorrow I'll show you my existing fabric stash. 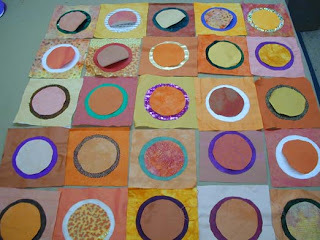 Together we'll decide whether I need to dye more fabrics or perhaps paint some yardage for those peaches and mangoes. Or maybe between now and then I'll get another bright idea and go off on it!